Up here in the gray Pacific North West winter, a rare sunny day needs to be properly appreciated. How better than this? I consider my photography skills to be serviceable, at best. I just don’t have the patience, aptitude and equipment to really pursue it, but once in a while, a bit of serendipity strikes. We were walking, and by the time I heard the unmistakeable symphony of a Porsche 356 engine announcing its coming, fished out my camera, and fired it up, it was almost gone. I panned a bit as I hit the trigger, something I normally never do, and lo and behold; it actually worked, more or less. I did a double-take, that’s hilarious! It’s as if Mr. Niedermeyer intended it that way. Nice car, surely Santa wanted to keep that present to himself. That particular photographic trick is one of the easier ones to pull off. To get the background blur you want, you just have to make sure your shutter speed isn’t set too fast. Give it a try at 1/15 sec., and you’ll be surprised how easy it is to get a keeper. Automatic pocket camera….If I’d tried to change its settings, the Porsche would have been long gone. Nice find! Ive driven all of my Jeeps top/door less in all kinds of chilly weather. That’s what hoodies and beanies are for. I do like these bathtub Porsches though. Neat little cars. Yup, a car on the move with a modern electronic camera is a crap shoot as far as results go. Some work, some don’t. This one works, and very nicely. Nice car , great pic. Glad there’s NO SALT there ! . 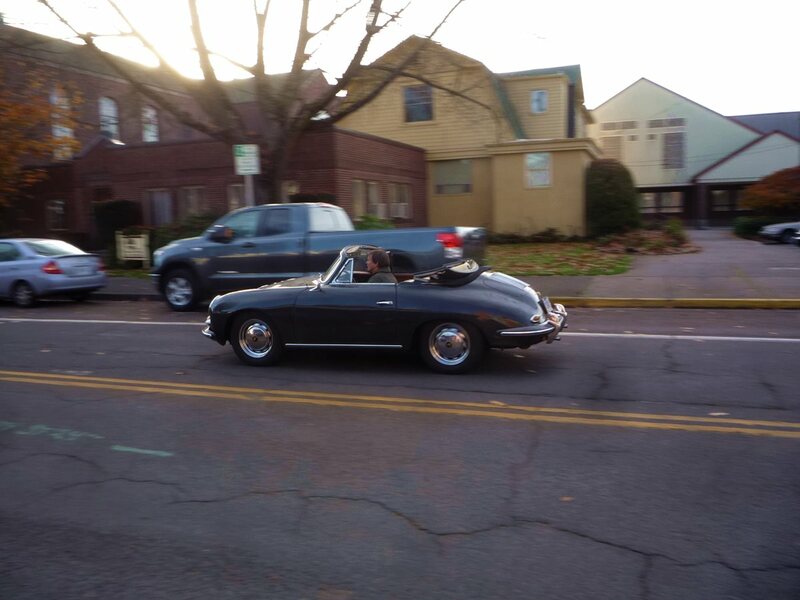 I wish my Son would put my old ’63 356B Coupe back to – gether again…. Heck, with my cheap cameras, I’m lucky to get a serviceable shot on a stationary object! There’s no more old car driving right now until the salt clears, but the weirdest winter driving I’ve ever seen was a beautiful ’65 E-Type coupe out on one of those icy, snowy, salty evenings where I’d never dream of bringing even the Dart out! I’ve often wondered if that guy had a terminal disease or something and was taking a last ride, or even if he’d just bought it and was driving it home. The first I understand, the second, not so much. My brother and I played in a Porsche like that when I was only 4. The owner left it unlocked, so we decided to get in and play. We never got caught. when i had my miata, i enjoyed nothing more on a cold crisp night then dropping the top, leaving the windows up and turning up the heater….did it all the time. i miss that car so much.